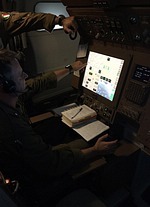 Giovanni Mattioli joined the 14° Stormo KC-767 flightcrew on a tanker mission, refueling Italian Air Force AMX and Typhoon fighter aircraft. 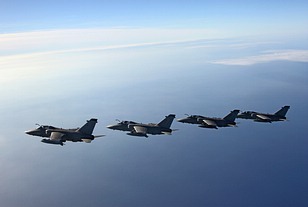 In late October 2015 the 8° Gruppo of the 14° Stormo from Pratica di Mare provided air refueling to the Italian fighter aircraft involved in the Live Exercise (LIVEX) of NATO’s joint exercise Trident Juncture 2015. 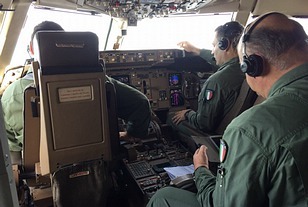 On the 22nd the KC-767 tanker flew from Pratica di Mare to the southern Tyrrhenian Sea to meet the fighters near the island of Ponza. 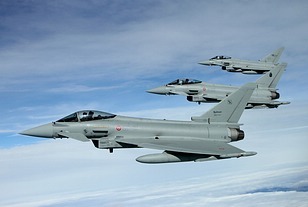 Half an hour later a formation of four F-2000 Typhoon fighters from various Italian Air Force Typhoon wings (Trapani, Gioia del Colle and Grosseto) showed up to refuel before returning to the exercise area of operations. 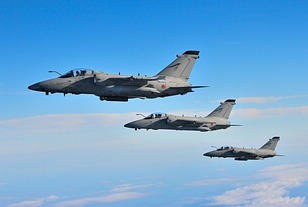 Following the Typhoons, a four-ship formation of AMX strike aircraft from 51° Stormo arrived for a refueling before and also after their mission for their return leg to Istrana. Mission duration was about 4 hours and the sun was going down as we returned to base. The Italian Air Force’s KC-767A aerial refueling tanker/transport is based on the Boeing 767, as its designation reflects. Italy’s KC-767A tanker program started in 2001 when Italy decided to acquire four KC-767s to modernize the tanker/transport capability, the contract was signed in 2002. Built on the 767-200ER the aircraft is fitted with boom and hose-drogue refueling systems on the centerline plus can be fitted with hose-drogue wing pods. 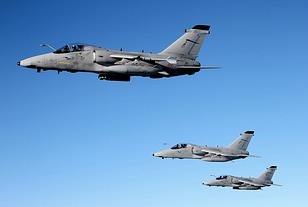 The first aircraft was unveiled in February 2005 at the Boeing plant in Wichita, KS, making its first flight on 21 May 2005. However delivery was delayed because of technical issues. 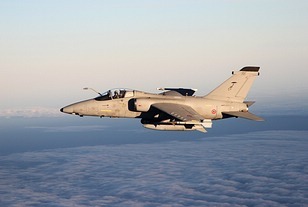 After resolving the issues, Boeing delivered the first aircraft to the Italian Air Force in January 2011 and on 17 May 2011 the KC-767A officially entered service with 8° Gruppo of the 14° Stormo. in particular sergeant Alessandra T.